Kotaku's in-depth pursuit of how and why NCAA Football 10 recognizes weird created-team nicknames - like Fightin' Planets, Ingots and Orange Psychos - created enough fan reaction that EA Sports is accepting new nickname submissions through an official forum thread. Since the publication of Saturday's Stick Jockey, I know I've been swamped with queries regarding certain nicknames and if EA was giving out contact information for suggestions. ("Maroon Devils," the nickname of Heath Shuler's Swain County High in North Carolina, was of particular interest.) 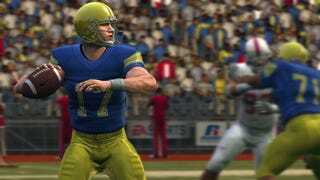 Adam Thompson, the EA Sports designer I talked to for the piece, started this thread yesterday to take suggestions for names included in NCAA 11. How it works: These are for teams created in the game's TeamBuilder mode. So if you pick a nickname the game recognizes, it'll pair it with a sound file recorded by booth man Brad Nessler, and lo and behold, the "Prayin' Colonels" have now been announced for battle. These aren't for teams shipping with the game (those are the 120 NCAA FBS teams only). So, nothing guarantees your suggestion will make it into the final retail code. But give it a shot. Nessler hasn't recorded his lines yet for this year's game, and Thompson expressed to me a personal frustration every time he sees a legitimate high school nickname is missing from NCAA 10's list of more than 2,400. And even if the goal is somewhat quixotic, the team really does want to get every single conceivable nickname in the game. Also, some have asked me if it's still possible to get their last name included in the game. The EA Sports site where they took last name submissions in 2009 is still up, but I'm not sure if the program's still active. You need to be a registered user (which is free) to make a submission.